Which Is a Better Laxative: Licorice Root or Dandelion Root? Constipation is a common gastric problem affecting almost everyone at some point. Abnormal stool frequency, straining during bowel movements and a feeling of incomplete evacuation are hallmarks of the unwelcome condition. Causes include insufficient intake of water, a low-fiber diet, medications and lack of exercise. 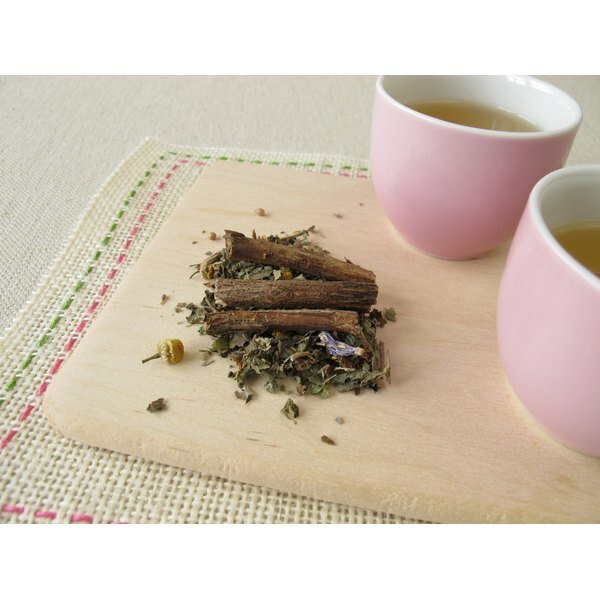 You can use herbal medicines such as licorice root to promote your bowel activity. However, use licorice root or other natural remedies with caution and only under the supervision of your doctor. Licorice is a perennial with large tuberous roots. This plant is native to Europe but has escaped cultivation in America. The root of the licorice plant is approved for the treatment of peptic ulcers, canker sores, eczema, dyspepsia and upper respiratory infections, according to the University of Maryland Medical Center. The high flavonoid content is responsible for most of its healthful properties. Licorice root is sold as teas, powders, capsules and tincture. Licorice root can be used in chronic constipation because it promotes peristalsis and aids in assimilation, according to James F. Balch, M.D., co-author of "Prescription for Nutritional Healing." Peristalsis is the process that forces feces in the large intestine through the gastric system. Take 50 mg of a standardized root extract at a time after two meals per day for a few days to achieve the desired effects. Psyllium laxatives — which come from a shrub-like herb called Plantago ovata — help reduce constipation, moving waste through the intestines. Glucomannan, another type of natural laxative, may be helpful for constipation. It comes from the root of the konjac plant. Other fibrous herbs such as flaxseed, fenugreek and barley also make valuable remedies for constipation. Most of these herbs are said to work because they add fiber and cause the intestinal muscles to contract, moving the stool along. Always seek the advice of your physician before starting any new treatment. Avoid using licorice products for more than six consecutive weeks unless your doctor is supervising because it may cause fluid retention and high blood pressure. The UMMC warns that people should not use licorice with heart, liver and kidney diseases. Licorice root can act as a blood thinner and may increase the risk of bleeding when taken with anticoagulant drugs such as aspirin and warfarin. What Kind of Tea is Good for Constipation? How Much Konjac Root Should I Take at Once? How Much Fiber in Fibercon Tablets?